In this episode, we hear two enchanting stories from the Mahabharata. 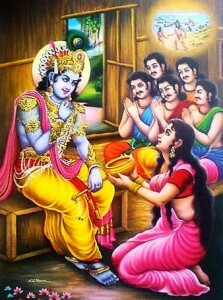 In the first story, Rishi Durvasa grants Mudgal an eternal life in heaven. But Mudgal declines the offer in search of eternal truth. The second story is more exciting. Pleased with Duryodhan’s hospitality, Durvasa offers him a favor. Duryodhan asks Durvasa to pay the Pandavas a visit to embarrass them. But Lord Krishna comes to the rescue and saves the Pandavas from the wrath of Durvasa. Listen to these stories by clicking the player below or download them on your smart device from iTunes.